Tom LaTour is the CEO of a chain of American boutique hotels which has expanded from a small regional group to a nationwide chain now owning 38 properties across 16 cities. Once a year, LaTour personally conducts a wine tasting class in each of his hotels. While he plies guests with Chardonnay, he asks them where else they travel regularly. “It’s a great way to find out where we might want to open up a new property,” he says. Unfortunately the opposite approach is true for many hospitality venues who wait for the feedback, usually in the form of a complaint to arrive of its own accord. Research has found that for every person who complains, there are 26 who do not. For example: If you had 100 covers for dinner service and the bread rolls were mouldy. If only 1 person complained to your staff, there would be another 26 people that would have quietly just walked out the door possibly never to return. If the statistics are correct, and let’s say 5 of the 26 people have posted online and the average person now has approximately 130 facebook friends, well this is starting to get a bit out of hand isn’t it? 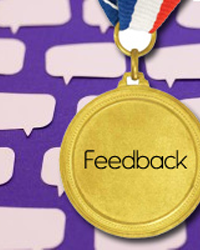 If you would like to discuss your customer feedback options and achieve that gold medal, please contact Samantha Litfin.